Pelin Atasoy developed a tool prompt alongside the method as a means to apply the method and to investigate the dynamics of the multi-stakeholder collaboration process. 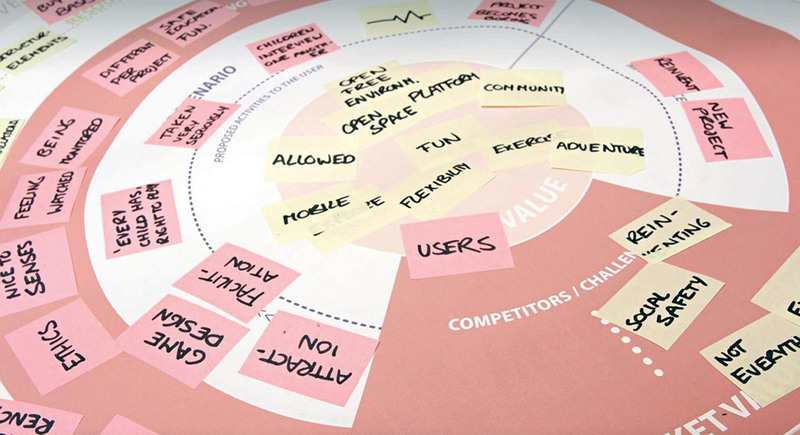 The Value Design Canvas is a paper based tool which is designed to be used in multi-stakeholder workshops at the innovation initiation stage. It represents the process, inspires the discussion and structure the design discussion with easy facilitation. Several versions of the tool prompt were developed and applied in workshop contexts for diverse design problems with many stakeholders. In the context of the ProFit Project, the Value Design Method was applied with the workshops at several stages through the project, both to define the requirements of the FieldLab services and to bring diverse stakeholders together to refine innovative product concepts together with designers. In the sessions complementary stakeholder groups composed of SME’s, sports-movement experts and students were brought together. The groups developed product and service concepts based on the design briefs and explored the business model possibilities in these sessions. The research output and the methodological tool is aimed to assist the FieldLab open innovation approach in the future by allowing diverse stakeholders to define a value proposition in a collaborative way.